As if the photo with Snoop Dogg wasn’t bad enough, I’ve now received a second photograph of my client, Trooper Billy Spears, in uniform at SXSW, standing next to a celebrity with a criminal history. As you can see from the photograph to the right, CeeLo Green is not just another celebrity with a criminal history, he’s a black celebrity with a criminal history. In his Wednesday night monologue, Jimmy Kimmel rightly observed that the last thing we need in this country right now is a picture of a black man getting along with a white cop. Now we have pictures of at least two black men getting along with a white cop. If this keeps up, a black man might try to marry a white cop. In fairness, I should explain that the photo with CeeLo Green is from last year’s SXSW, but then that actually makes things all the more interesting. At the 2014 event, Billy had not yet clashed with his superiors over his misconduct complaint against Sgt. Marcus Stokke of the Texas Alcoholic Beverage Commission. 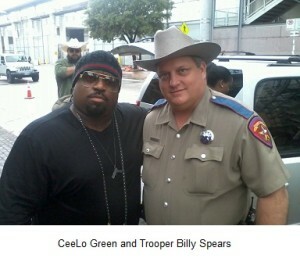 In other words, when the picture was made with CeeLo Green, Billy’s DPS superiors had no incentive to paper his file with bogus disciplinary allegations. 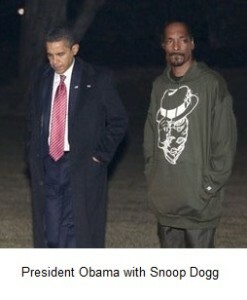 And the picture with CeeLo Green was not a secret. Billy’s wife is active in the DPS Officers Association Auxiliary, and she posted the photo on her Facebook page. Yet DPS didn’t care, at least not at that time. As a deputy sheriff, I always had a high opinion of DPS, but now I’m not so sure. After last week, DPS headquarters is looking a lot more like FBI headquarters: lots of politicians and bureaucrats wearing guns and badges. Even so, I don’t know that FBI headquarters has as many people with corn cobs stuck in their respective exhaust shafts. 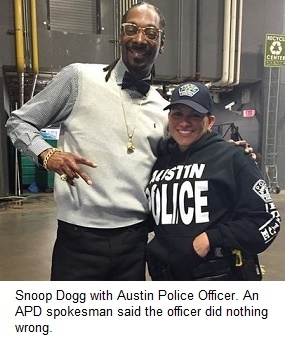 After all, you would have a hard time coming up with a worse public relations strategy than DPS’s response to the Snoop Dogg / Billy Spears uproar. Never mind the coast-to-coast outrage in the U.S., the uproar has made its way to India, Ghana, Australia, England, Ireland, New Zealand, and Canada, and those are just some of the English-speaking countries. But rather than back down from a stupid decision, DPS headquarters doubled down with a snarky (and dishonest) press release in support of its actions against Billy. If I had been Col. Steven McCraw, the DPS director, I would have publicly said that my staff overreacted and that the “counseling record” (their term, not mine) was a mistake. He would have been the hero, and the story would have ended right there. But he did the exact opposite, and I cannot imagine what he was thinking. Now he owns this fiasco. Personally. Attached you will find TABC’s policy for investigating allegations of employee misconduct. I am a [redacted] and I know that Captain Pena has investigated numerous unsigned complaints. The attached policy even outlines the procedures for investigating such complaints. Regardless who is involved right is right and wrong is wrong, investigate the complaint and let the chips fall where they may. Hell, if I was you I would file a complaint on Captain Pena for not following TABC policy. The TABC is quick to boast about it being transparent, what a bunch of [bovine excrement]. How could I ignore such a great suggestion? You can read my complaint against Captain Pena and Sgt. Stokke by clicking here. Incidentally, DPS still has not responded to my question about whether it uses facial recognition software to monitor its employees on social media. I asked my “Yes” or “No” question last Monday and was told to expect an answer last Tuesday. Reporters have since asked the same question, and DPS still has not responded. Why not? Perhaps because the Texas House of Representatives approved a $551 million budget for DPS last week, and that proposal is now being negotiated in conference committee with the Texas Senate. I doubt that Col. McCraw and his homeboys want to discuss the agency’s use of facial recognition software while they’re trying to persuade legislators to give them more money.